Flowers, music, cars, catering, photography. The fun extras that make your day that personalize your wedding. The aim of Original Tuscan Wedding is to make your wedding or other events you have here in Italy, truly special. We are here to do the problem solving, the coordination and overcome language barriers, while you relax and enjoy your day. We are proud to say we collaborate with the best local photographers in Tuscany. 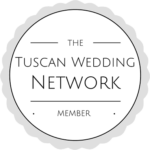 We have selected wedding photographers from the thousands out there who are not only talented and have excellent know-how of the venues and the best locations for your photo shoot, but are also fun to work with and put you at ease. Italian food and wine are the number one reasons to marry in Tuscany. We work only with villas and wineries that have excellent inside caterers and where we can bring in a company from outside, we use the best local firms. We assist with the menus, bookings, setting up and attending tastings and help you decide which table setting, chairs and fun extras they offer suit best your budget and the venue. So much of what reflects your personal taste at a wedding is tied to the theme colors and style. We have an amazing floral team that can help you turn your ideas into reality for a stunning bouquet, table decoration, lanterns, arches and whatever else you love. Now this is the fun part! Music and its changing sounds and style create the mood for your event. We work with the best local entertainment companies to book live musicians, technical support, wonderful lighting and dancefloors. Over the years we have formed an alliance with creative, professional stylists for hair and makeup. They use the latest techniques and are always updating their skills with courses. They put our brides and VIP ladies at ease and make them feel like princesses for a day. Whilst we are 100% logistics freaks – smooth logistics make your event successful! – we also love fun vintage cars and vespas. What fun bridal car would you like?